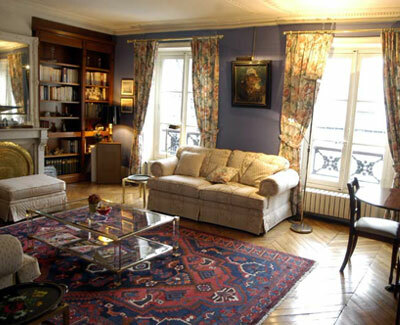 In the heart of the very chic 7th arrondissement, this particularly charming apartment is within easy walking distance of the Musée d'Orsay. Cross the Pont Royal bridge over the Seine to the Louvre and then relax in at outdoor café amidst the quintessential elegance of the Tuileries Gardens. Continue your perigrinations via the Jeu de Paume and Orangerie Museums from where you may cross the Place de la Concorde, admiring the Crillon Hotel on your right, onto the most beautiful avenue in the world, the Champs Elysées! Or in another direction, take a glance at Napoleon's outrageously elaborate tomb, explore the boutiques on the rue du Bac, the rue de Grenelle and then on to the Boulevard St Germain, and the Latin Quarter, for designer boutiques, the famous Café Flore, les Deux Magots, and why not stop for lunch at the mythical Brasserie Lipp? Two metro lines within five minutes walk will take you quickly and comfortably to destinations further afield. We are very pleased to have been entrusted this elegant 4th floor apartment. The elevator (an after-thought!) is very small indeed and any large luggage will have to be carried upstairs.